People generally spend a large part of their lives in the workplace and for many the work they do forms a big part of their identity. It is no wonder then that the concept of ‘happiness at work’ (HAW) has received a lot of attention. It stands to reason that people who are happier at work are also happier about their organisation and express this their family and friends, thus raising the attractiveness of their organisation to the outside world. Having an attractive organisation is becoming increasingly important as the world is experiencing an economic boom again, after years of recession and decline. Already shortages can be seen in various labour markets, such as the healthcare sector, meaning that organisations have more trouble attracting high quality people thus causing the start of another “war for talent”. In addition, it becomes increasingly clear that many employees are not engaged or even actively disengaged in their jobs. Thus, it is in the best interest of organisations to be attractive to both potential employees and current employees. Interestingly enough, there is no research into the relation between HAW and the attractiveness of an organization. And in the research that is available, there seems to be no consensus on how HAW can be increased. This is troubling because a lack of knowledge makes it difficult for organisations to promote HAW. 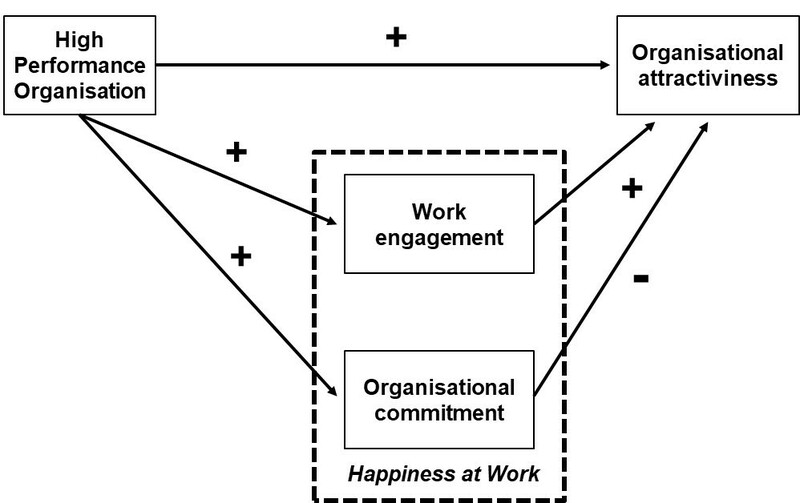 A particularly for me interesting area of study in this respect is how happiness at work can be achieved by better managing the work environment, as little is known about the influence of the organisational context on HAW. Looking into this area gave me the opportunity to walk in the footsteps of Aristotle who said: “In order to achieve the good life people must work in good organizations.’’ No doubt the great philosopher was talking about high performance organisations! So I decided to conduct research into three questions: 1. Does higher happiness at work increase the attractiveness of the organisation? ; 2. Does becoming an HPO increase happiness at work? ; and 3. Does becoming an HPO increase the attractiveness of the organisation? Together with Direction, a sister company of the HPO Center; and Driessen, a human resource consultancy with which the HPO Center cooperates, we approached approximately 12 thousand people with an internet-based survey which measured the level of high-performance of the respondents’ organizations, the attractiveness of these organizations, and how happy the people working in these organizations were. We received 624 completed surveys, a response rate of approximately 5 percent which is normal for this type of internet-based survey. After performing the statistical work, the following very interesting HAW model was developed (Exhibit 1). Exhibit 1 shows a positive relation between the HPO factors, the HAW factors and organisational attractiveness. This means that when an organisation is high performing, it is also seen as attractive to its employees and the external world, and its employees are happier than people working in ordinary organisations. This result means that both question 2. Does becoming an HPO increase happiness at work? and 3. Does becoming an HPO increase the attractiveness of the organisation? can be answered in a positive manner. This results clearly calls for organisation to transform themselves into HPOs in order not only to achieve better financial and non-financial results (as I have shown in numerous other research studies) but also become more attractive to employees and potential employees, thus having a head start in ‘the war for talent’. This transformation to HPO is all the more urgent because of the interesting outcome depicted in Exhibit 1: the negative relation between organisational commitment and attractiveness of the organisation. This is a counterintuitive result, which can be explained by people who were initially very committed to their organisation – probably because it was the organisation that made it possible for them to do work that they really loved and engaged with – might get frustrated with the organisation when it is not run properly and in the way that they deem fit and advantageous for the long-term thriving of the organisation. Support for this explanation might be found in the average score for the HPO factor Management Quality for Dutch organisations which is 6.6, indicating that these organisations are run on a satisfactory level but not exceptionally well. Thus, the initial commitment of employees to the organisation might turn into frustration with how it is being managed, making the organisation less attractive in their eyes. My research results reinforcing the message that in order for an organisation to become and stay attractive to its workforce and potential employees it would do good to transform itself into a high performance organization, as quickly as possible!